It's that time of the year again: The 75th annual Golden Globe Awards is happening. Held at the Beverly Hilton, it's one of the biggest nights for all your favorite Hollywood celebrities. 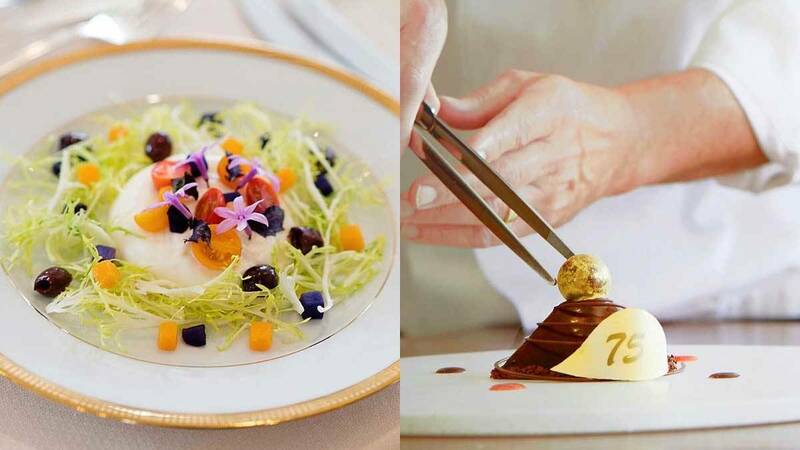 Chef Alberico Nunziata and executive pastry chef Thomas Henzi are in charge of three delicious courses. To start, the stars are served a burrata called Delicata; it's made of burrata cheese, opal basil, teardrop tomatoes, Taggiasca olives, golden friseé, roasted butternut squash, purple sweet potatoes, topped with extra virgin olive oil, balsamic vinegar, and garlic flowers. For the entrée, they've prepared a Mediterranean Chilean Seabass with a beet parmesan risotto. It's also embellished with olive tapenade, broccolini florets, golden stripe baby beets, yellow squash, and zucchini. It's made of white chocolate coffee cream, coffee liqueur biscuit, mascarpone, and praline. To celebrate another successful year in Hollywood, actress Jamie Chung created a cocktail called The Moët 75. It's a mix of tequila, blood orange juice, honey, and of course, Moet & Chandon.